This fantastic purpose-built property is located just metres away from the lake in central Queenstown, with views of the snow-capped mountains. We have large and small dorms with or without en suite and family suites. All dorm rooms have lockers which can hold a computer (and charge it at the same time) as well as hanging space and reading lights for every bed. Our amazing hotel-style king rooms come with flat-screen televisions (with SKY and sports channels, very important when the rugby is on! ), fridge, iron and ironing board. Our hostel is sure to impress. The property also has a fully equipped modern kitchen, a movie room, an amazing lounge with a fireplace, a sauna, internet access with WiFi throughout, a travel desk and ski storage. We have our very own travel gurus at both our information desk, who can book all your crazy activities and forward travels. This amazing property is an experience in its own right and a must-do on your trip in New Zealand. We want to make sure people have a great time with us here and our friendly staff will make that possible. We have a 48hr cancellation policy. Late cancellations and no-shows shall be charged the equivalent of the first night's accommodation. Please note we are a dry hostel, but we're lucky enough to have our own bar so you can get your locals deals! We have free WiFi in the lobby area 24 hours of the day. If you would like high speed access in your room, we also offer options through our GX2 network, which is $4.00 for 24 hours of unlimited access, or $12 for 7 days of unlimited access. Please be aware that whilst we try our best, we cannot guarantee reservations will all be allocated in the same rooms. Overall this hostel is a great place to meet people with a very spacious lounge area. The cute receptionist Ellie was extremely Awesome and helpful with everything I needed to know about the hostel and Queenstown as a whole. She was extremely knowledgeable, personable, and kind! She made everyone feel very welcome and was the epitome of hospitality! I will definitely be staying here again because of the awesome staff and recommend everyone do so! Amazing!!!! Loved the hostel and the staff everything just felt so comfortable to be around and it’s super easy to meet friends with the huge communal area. Also travel desk lads are amazing helped me figure out exactly what to do. The hostel was in a central location. The room was big and the air con actually worked. It was a busy hostel but the nose was tolerable. Facilities were great. The staff was always happy to help. Great place, comfy beds in spacious rooms with plenty of plugs and own lights and lockers, bathrooms cleaned regularly, helpful staff, lovely communal area with a fire. Location also ideal. Only downside was that lots of the hobs didn’t work so the kitchen was so busy at meal times, and there’s not WiFi in the rooms. It was nice staying there for a night, the bed was really clean, and the room too, but both sinks in bathroom and restroom where clogged.. might want to check on that! Really inconvenient! Nomads is surprisingly clean for its size. The common areas are way nicer than Base Hostel. The kitchen is a bit small but well stocked and functional. They could use a bit more fridge space for longer stays. Balconies in the rooms are a nice feature! 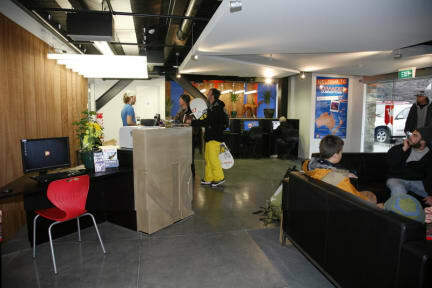 If you’re looking for a cheap hostel in Queenstown this is probably your best bet. Very noisy on a Sunday night.